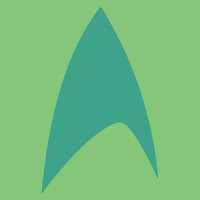 Five and a half years after turning my Star Trek forum name into a blog I've decided it's about time I got a slightly more stylish url than 8of5.blogspot.com, and so I have rechristened myself: www.thetrekcollective.com. I've also tweaked the name of the site a little, from 8of5's Guide to the Trek Collective, to simply, The Trek Collective - Which neatly summarises the world of Trek stuff I report on. So do feel free to update your bookmarks and such (although the old address should redirect you). And while I'm waving the flag of self promotion. Don't forget I'm also on Facebook, Twitter, and Tumblr! Also, I have a new email to go with my new url: 8of5 at TheTrekCollective.com. Love it! Excited to see what you do with your new freedom! Always enjoy your site and the incisive (and humourous) comments, many thanks! I'll miss the old mathematically-challenging "8 of 5" moniker but I wish you best of luck with the new site name and addy! Oh I'm still very much 8of5 :) Just without declaring it at the top of every page! Klingon Bird of Prey, in a box.